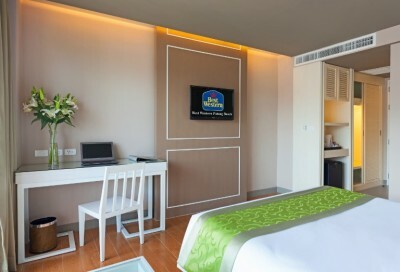 Bangkok (Thailand) – July 14, 2015 – Guests booking two nights at BEST WESTERN Patong Beach can now get a third night FREE! Available throughout 2015, our attractive ‘Discover Asia’ promotion allows guests to explore Phuket – Thailand’s most popular resort island – for longer and for less. BEST WESTERN Patong Beach Hotel is a stunning midscale hotel located in Phuket’s popular Patong Beach area. Ideal for tourists and business travelers alike, the hotel’s 224 air-conditioned rooms all feature refrigerators and flat-screen televisions. Complimentary wireless internet access ensures guests are well connected, and international cable channels are available on LCD flat-screen TVs. BEST WESTERN Patong Beach is located less than 1km from the famous white sands of Patong Beach, Junceylon shopping center, and a multitude of bars, restaurants and entertainment venues. – Minimum three-night stay is required at participating Best Western hotels. – Reservations must be made at least 24 hours in advance and are subject to availability. – Rates are subject to applicable taxes. – The ‘Discover Asia’ promotion cannot be combined with any other discounts or promotions. – Best Western reserves the right to modify or cancel this offer at any time and without prior notice. From the beaches of Bali to the bright lights of Bangkok, the skyscrapers of Tokyo to the temples of Yangon, Best Western has the perfect hotel for your next Asian adventure. And with our ‘Discover Asia’ promotion, you can spend an extra day exploring this captivating region! Best Western International is ‘THE WORLD’S LARGEST HOTEL CHAIN®’, comprising more than 4,000* independently owned and operated hotels in 100* countries and territories worldwide. We offer six hotel products to suit the needs of developers and guests in every market: BEST WESTERN®, BEST WESTERN PLUS®, BEST WESTERN PREMIER®, BEST WESTERN PLUS EXECUTIVE RESIDENCY®, Vib® and BW Premier Collection®. Best Western Asia first launched in Bangkok in 2001 and now covers 15* countries in the region, with more than 100 hotels either operating or in the pipeline. For hotel owners, Best Western offers a broad range of operational support, including sales, marketing and distribution, with online, mobile and social media booking capabilities. The award-winning Best Western Rewards® guest loyalty program has 22 million members. *Numbers are approximate and can fluctuate. For more information on development opportunities in Asia with Best Western International, please visit www.bestwesterndevelopers.com or contact us at moc.nretsewtseb@tnempolevedaisa.